At the first Kickstarter, 149 people supported us, 41 of them gave the names of their characters in mass events and 8 people who took Immortality pledge, now work with the author personally, describing their heroes - their names, gender, race, appearance, behavior or some unique visual features! All this is possible! Backers and we love it and excited! It turns out very interesting! However, so far we will not reveal secrets. The “Verge of Light” book will be available for sale on our website after a multi-stage proofreading and correction. Pledge’s immortality backers will receive printed version. Note that in the future it will be possible only for the best and most active players to enter their character in the book according to the results of the Annual Season! Only! And the further, the more our game, its background and quantity of players, the more difficult it will be to do. Our Kickstarters provide a unique opportunity now, supporting us at the beginning of the "journey", to do it! In more detail about the Intelligent Feedback System (IFS) and how players can collect personal points and what the game season is, we will tell you more in the following articles. Thanks to our backers support, we created the basis of two armies that participated in the battle for the Griffon - the Humans and the Seits. New miniatures such as the free pose Knight model and the Self-propelled Howitzer “Scorpion” in the Human Army, as well as the Killer drone “Raiksyly” and Light assault drone “Carsyly” in the Seit Army appeared. In the second Kickstarter, we plan to expand further their armies with the help of the Stretch Goal section, as well as to introduce the following two armies - the Pirates and God-like Asgars, one of the oldest races in the Galaxy. We will definitely write about them in the following articles. 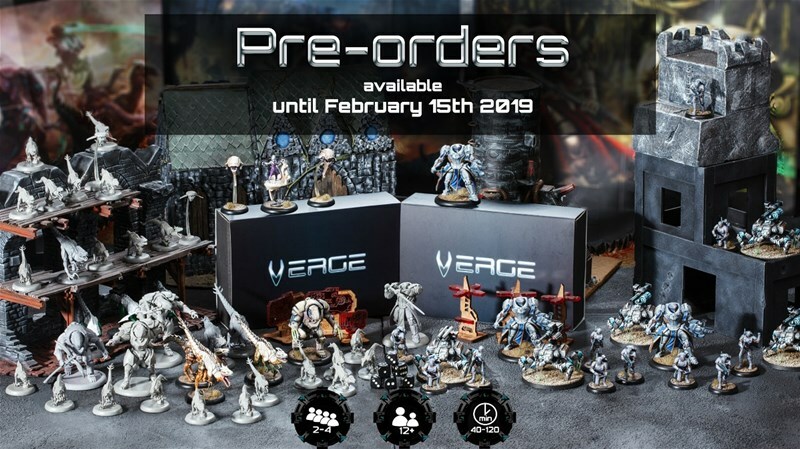 Pre-orders for Core Box/Full-Force Box and All-in Box with two sets of armies and Late Pledges for backers are opened until February 15th, 2019! Check it on our website vergeofwar.com -> store -> pre-order. Welcome! Don`t miss your chance to plunge into a new unique sci-fi world, gather your unique army, integrating your creativity and become an active creator of the history of Verge of War!